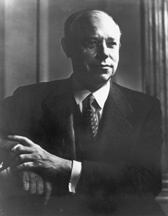 Robert Alphonso Taft (September 8, 1889 - July 31, 1953), of the Taft political family of Ohio, was a Republican United States Senator and as a prominent conservative spokesman was the leading opponent of the New Deal in the Senate from 1939 to 1953. He led the successful effort by the Conservative coalition to curb legal favoritism for labor unions. He was also referred as Mr. Republican. His espousal of a traditional isolationalist policy clashed with the internationalists in his party, which is why his bid for the Presidential nomination of his party failed in 1940, 1948, and 1952. He opposed U.S. involvement in World War II, only changing his mind after Pearl Harbor. He could appeal to the founding fathers, who did not want their new republic to become entangled in foreign alliances, and in other people's war. His dislike of foreign alliances continued in the post-war context, when he opposed the formation of NATO. He was nonetheless a distinguished and able politician, whose policies were intended to protect America from unnecessary expenditure. Unlike others, he did not transfer the concept of "manifest destiny" from the domestic, to the international scene, or posit a global mission for his nation as the champion of liberty and democratic self-governance. Had Taft won his party's nomination in either 1948 or 1952, and the subsequent Presidential election, he may not not regarded the Cold War as America's business, and history would have been very different. He was nonetheless a distinguished and able politician, whose policies were intended to protect America from unnecessary expenditure. His opposition to the New Deal was also based on the idea that government should leave the private sector to deal with issues of welfare and employment, and remain "small." Taft was the grandson of Attorney General and Secretary of War Alphonso Taft, and son of President and Chief Justice William Howard Taft and Helen Herron Taft. As a boy he spent four years in the Philippines, where his father was governor. He was first in his class at The Taft School, at Yale College and at Harvard Law School, where he edited the Harvard Law Review. After finishing first in his class at Yale and Harvard Law School, he practiced for four years with the firm of Maxwell and Ramsey in Cincinnati, Ohio, his family's ancestral city. After a two-year stint in Washington, working for the federal Food Administration, he returned to Cincinnati, opened his own law office, and ran and was elected to the state legislature. In 1924, he and his brother Charlie helped form the law partnership Taft, Stettinius, and Hollister, with whom he continued to be associated until his death and which continues to carry his name today. On October 17, 1914, he married Martha Wheaton Bowers, the heiress daughter of Lloyd Wheaton Bowers, who had served as his father's solicitor general. Taft himself appeared taciturn and coldly intellectual, characteristics that were offset by his gregarious wife, who served the same role his mother had for his father, as a confidante and powerful asset to her husband's political career. They had four sons including Robert Taft Jr., who was elected to the Senate; Horace Dwight Taft, who became a professor of physics and dean at Yale; and William Howard Taft III, who became ambassador to Ireland. Taft's grandson Robert Alphonso Taft II was the Governor of Ohio from 1999-2007. Taft was rejected by the army for poor eyesight, in 1917 he joined the legal staff of the Food and Drug Administration where he met Herbert Hoover who became his mentor. In 1918-1919, he was in Paris as legal adviser for the American Relief Administration, Hoover's agency which distributed food to war-torn Europe. He learned to distrust governmental bureaucracy as inefficient and detrimental to the rights of the individual, principles he promoted throughout his career. He distrusted the League of Nations, and European politicians generally. He strongly endorsed the idea of a powerful World Court that would enforce international law, but no such idealized court ever existed during his lifetime. 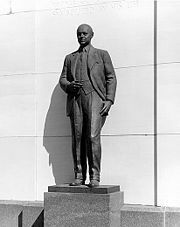 He returned to Ohio in late 1919, promoted Hoover for president, and opened a law firm with his brother Charles Phelps Taft II. In 1920, he was elected to the Ohio House of Representatives, where he served as Speaker of the House in 1926. In 1930, he was elected to the state senate, but was defeated for reelection in 1932. As an efficiency-oriented progressive, he worked to modernize the state's antiquated tax laws. He was an outspoken opponent of the Ku Klux Klan; he did not support prohibition. Throughout the 1920s and 1930s, Taft was a powerful figure in local and state political and legal circles, and was known as a loyal Republican who never threatened to bolt the party. He confessed in 1922 that "while I have no difficulty talking, I don't know how to do any of the eloquence business which makes for enthusiasm or applause". A lackluster speaker who did not mix well or glad-hand supporters, nevertheless Taft was a tireless worker with a broad range of policy and political interests. His total grasp of the complex details of every issue impressed reporters and politicians. Taft was elected to the first of his three terms as U.S. Senator in the election of 1938. Cooperating with conservative southern Democrats, he led the Conservative Coalition that opposed the "New Deal." The expansion of the New Deal had been stopped and Taft saw his mission to roll it back, bringing efficiency to government and letting business restore the economy. He criticized the New Deal as socialistic and attacked deficit spending, high farm subsidies, governmental bureaucracy, the National Labor Relations Board, and nationalized health insurance. He did, however, support social security and public housing. Taft set forward a conservative program oriented toward economic growth, individual economic opportunity, adequate social welfare, strong national defense, and non-involvement in European wars. Taft was re-elected again in 1944 and in 1950, after high-profile contests fighting organized labor. 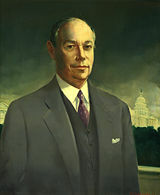 He became chairman of the Senate Republican Conference in 1944. Taft was a contender for the GOP presidential nomination in 1940, losing to charismatic Wendell Willkie. As a U.S. senator, he was given the nickname "Mr. Republican"; he was the chief ideologue and spokesperson for the paleoconservatism of the Republican Party of that era. As a leader of the Old Right non-interventionist wing of the GOP he strove to keep the United States neutral during 1939-1941, and opposed the draft. He supported the general principles of the America First Committee but did not join it. However, he strongly supported the war effort after the Japanese Attack on Pearl Harbor. When the Republicans gained control of Congress in 1946, he focused on labor-management relations as chair of the Senate Labor Committee. Decrying the effect of the Wagner Act in tilting the balance toward labor, he wrote and passed over Truman's veto the 1947 Taft-Hartley Act, which remains the basic labor law as of 2006. It bans "unfair" union practices, outlaws closed shops, and authorizes the President to seek federal court injunctions to impose an eighty-day cooling-off period if a strike threatened the national interest. Taft was reluctant in his support of farm subsidies, a position that hurt the GOP in the farm belt. Moving a bit to the left, he supported federal aid to education (which did not pass) and cosponsored the Taft-Wagner-Ellender Housing Act to subsidize public housing in inner cities. In terms of foreign policy he was non-interventionist and did not see Stalin's Soviet Union as a major threat. Nor did he pay much attention to internal Communism. The true danger he said was big government and runaway spending. He supported the Truman Doctrine, reluctantly approved the Marshall Plan, and opposed NATO as unnecessary and provocative. He took the lead condemning President Harry S. Truman's handling of the Korean War. Taft sought the GOP nomination in 1948 but it went to his arch-rival, Governor Thomas E. Dewey of New York. Taft relied on a national core of loyalists, but had trouble breaking through to independents, and disliked fundraising. Taft tried again in 1952, using a strong party base. He promised his supporters that he would name Douglas MacArthur as candidate for Vice President, but was defeated by Dwight Eisenhower. After the convention Taft issued a brief statement conveying his congratulations and support to Eisenhower. As the weeks passed, Eisenhower's aides worried that the Taft forces would sit on their hands during the campaign. In September, they finally arranged a meeting between the two leaders, at Morningside Heights in New York City. There, in order to gain Taft's support in the campaign, Eisenhower promised he would take no reprisals against Taft partisans, would cut federal spending, and would fight "creeping socialism in every domestic field." All along Eisenhower agreed with Taft on most domestic issues; their dramatic difference was in foreign policy. Eisenhower firmly believed in NATO and committed the U.S. to an active anti-Communist foreign policy. Taft served as Senate Majority Leader in 1953, and he strongly supported Eisenhower's domestic proposals. He worked hard to assist the inexperienced new officials of the administration. He even tried–with little success–to curb the excesses of McCarthyism. By April the President and Taft were friends and golfing companions, and Taft was praising his former adversary. After contracting cancer in April 1953, Taft continued to work hard, but an exploratory operation in July revealed that the cancer was widespread. After a brain hemorrhage Taft died in a New York hospital on July 31, depriving the new administration of its ablest supporter on Capitol Hill. He is buried at Indian Hill Episcopal Church Cemetery in Cincinnati. In 1957, a committee led by Senator John F. Kennedy selected Taft as one of five of their greatest Senate predecessors whose oval portraits would adorn the President's Room off the Senate floor. Kennedy would profile him in his book Profiles in Courage. This Memorial to Robert A. Taft, presented by the people to the Congress of the United States, stands as a tribute to the honesty, indomitable courage, and high principles of free government symbolized by his life. This page was last modified on 15 July 2015, at 16:18.